Summary: Young FBI agent Chevie Savano arrives back in modern-day London after a time-trip to the Victorian age, to find the present very different from the one she left. Europe is being run by a Facsist movement known as the Boxites, who control their territory through intimidation and terror. Chevie's memories come back to her in fragments, and just as she is learning about the WARP program from Professor Charles Smart, inventor of the time machine, he is killed by secret service police. Now they are after Chevie, too, but she escapes--into the past. She finds Riley, who is being pursued by futuristic soldiers, and saves him. Working together again, it is up to Chevie and Riley to find the enigmatic Colonel Clayton Box, who is intent on escalating his power, and stop him before he can launch missiles at the capitals of Europe. Review: There's only one word for this book - BLOOMING AMAZING! OK so that was two, but you're supposed to say them together because you're in a rush to tell people how good this book is. Colfer has breathed fresh life into Victorian London, and it was one that I fell into completely and instantaneously. There is a great pleasure in being able to do this, and I remembered all the joy I had got from The Reluctant Assassin. In this second instalment, not only do we get to go back to Riley's London but we are also being given a glimpse into a possible future, of a very different London. This new London is under strict regime, from Colonel Clayton Box, Miley and Gaga no less (read it and you'll see what I mean). This isn't a London any of us would want to be in. 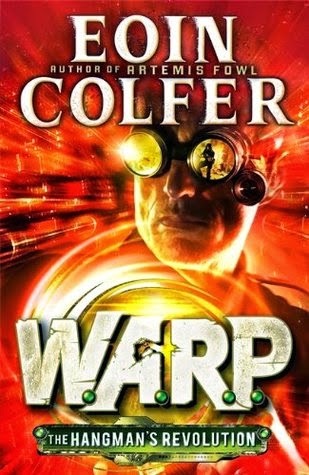 The magic of this book is in Colfer's writing, which flowed effortlessly with such a humorous flare were I was constantly laughing wherever I may have been at the time (and to whatever looks I may have received - it was worth it!). This helped the chapters flow in quick succession, and the saddest part of this book was when I'd finished. The subtle inclusion of modern references, and the mix of modern terminology in Victorian never fail to bring out a smile. Once again, for me at least, Riley is the star of the show, a character full of life and vigour, wit and charm. I sincerely hope there is a lot more of Riley to come. As a tag team Riley and Chevie work very well together, not in the same league as Holly and Artemis, but I feel it would be wrong to try and put them in any sort of comparison because the feel here is completely different. I enjoyed the development of King Otto as a character, and feel that as a 'gang' of character we have now gathered, that will play out to different strengths as the series pans out. Under all the adventure, Colfer digs deeper, more personal threads into his stories, from issues of family and belonging to politics and religion. Here the issue of religion is played out in both a political and personal way, and really makes you think about your choices and how they can be effected by the actions and opinions we hold. Whilst this is a heavy topic, Colfer dealt with it in an effective and accessible way that became pivotal to the unfolding of the drama. This is a cracking read, whether you've read the first instalment or not, and a must read for anyone looking for anything from comedy, to history, to adventure or all of the above! I'm eagerly looking forward to the future (and the past) of things to come in this series.